NanoVi™ helps repair everyday cell damage caused by what you eat, what you breathe, what you are exposed to, and oxidative stress. Do you want to strengthen your immune system, increase your vitality, and slow the aging process? Eng3's patented NanoVi™ technology produces the same biological signal your body makes to repair cell damage brought on by free radicals (also known as reactive oxygen species or ROS). The signal from the NanoVi™ device supplements the ones your body makes naturally. The problem is, if you don't make enough of the signal necessary to repair all the damage caused by free radicals, oxidative stress accumulates. And when free radicals and oxidative stress have the upper hand, you lose. Who needs to worry about free radicals and oxidative stress? Everyone - there's no avoiding it. Free radicals damage your cells each day. Damaged cells lead to aging and poor health. So if you want to strengthen your immune system, increase your vitality, and slow the aging process, you'll want to understand how excess free radicals and oxidative stress can harm your body. Every cell needs to convert oxygen and glucose into energy. This ongoing process called cell metabolism is essential for all cells. Metabolism produces two kinds of highly reactive oxygen radicals known as ROS. For simplicity, you can think of one ROS as bad and the other, good. “Bad ROS” are free radicals that damage your cells, whereas “good ROS” emit the signal that initiates cell repair. Unfortunately, the damage always outpaces the repair. Antioxidants help prevent damage by neutralizing ROS but they can do nothing to repair cells. This is where NanoVi™ can help. By producing precisely the same signal as the "good ROS", NanoVi™ augments your body's natural repair mechanisms. Perhaps the most miraculous things about the NanoVi is how easy and relaxing it is to use. Sit back and relax in our lounge chair for 30 minutes while you breathe in the treatment. It’s that simple! You can add on other treatments like normatec or PEMF while receiving your treatment to further maximize your time and recovery. Athletes use the NanoVi™ device to accelerate recovery, improve energy levels and boost immunity. NanoVi™ is drug-free and complies with the World Anti-Doping Code. Studies confirm its benefit. Recovery from exertion and injury is critical to professional and amateur athletes alike. Performance athletes experience a demanding cycle of oxidative stress damage and repair. Pushing to the limit is essential for building strength, endurance, and ability. However, it also generates additional free radicals, leading to oxidative stress damage. Athletes must repair oxidative damage quickly to stay healthy and perform well. Athletes metabolize much more oxygen than non-athletes – in some cases more than 100 times the amount of non-athletes. 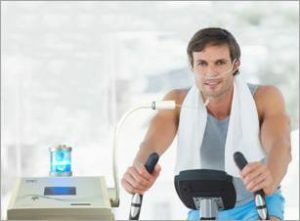 The additional oxygen metabolism is necessary for performance, which is why so many athletes also use EWOT (exercise with oxygen therapy). But it also has a downside because the related oxidative stress hinders regeneration and ultimately performance. Many athletes try to avoid damage by taking antioxidants via food and supplements. Unfortunately, oxidative stress is often more widely spread than antioxidants can keep up with and once damage is done antioxidants do nothing to repair it. Although antioxidants play an essential role in preventing oxidative damage, they should be used wisely because overdoing antioxidants can suppress your repair functions. Fortunately, the body is well designed to repair oxidative damage. Certain ‘signaling molecules’ activate various proteins in the body to repair the oxidative damage but when the body’s response cannot keep up with the oxidative damage being done, recovery suffers. The NanoVi™ uses bio-identical signaling to stimulate the body’s cellular activities to counteract oxidative stress damage. Like the natural signaling molecules, the signal from the NanoVi™ device triggers cellular repair. The impact of boosting the repair side of the equation, tipping the balance in favor of recovery, is noticeable to athletes of all ages. Bouncing back quickly after exertion and feeling vital while active make all the difference, regardless of your age, ability level, or whether you compete or not.